KMB BUS 5R SERVICE EXTENSION: There will be 2 additional 5R bus service at 0900 and 1000 hours on every Sunday (leaving from the Kai Tak Cruise Terminal) until the end of June 2019. Shop at Kai Tak Cruise Terminal now available for lease. Click here to download the file for more information. For enquiries, please contact 3465-6888 or Email Us for more information. To see our latest press releases, please click here. Kai Tak Cruise Terminal was named one of three finalists for the “Seatrade Cruise Awards 2017: Environment Initiative Award.” It is the first Asian finalist for this accolade. The Kai Tak Cruise Terminal, operated by Worldwide Cruise Terminals celebrated the arrival of its one millionth cruise passenger on 27 June 2017. TRAFFIC NOTICE: Kindly note that the Kaito service sailing between Kai Tak Runway Park and Kwun Tong Public Pier has been terminated as of 27 Nov 2016. However, a new ferry service will commence service between North Point and Kwun Tong via Kai Tak Runway Park Pier starting 3rd December 2016 (Saturday). Click HERE for full timetable and details. Worldwide Cruise Terminals, management company for the Kai Tak Cruise Terminal, won the “Green Achievement Award – Certificate of Excellence” from the HSBC Living Business Awards 2016. The Kai Tak Cruise Terminal, managed by Worldwide Cruise Terminals, was named one of three finalists for the “Seatrade Cruise Awards 2016 Port of the Year Award”. It is the first Asian port to make the finals. 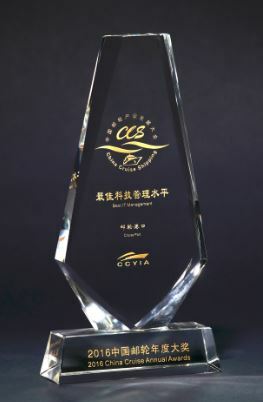 Worldwide Cruise Terminals, management company for the Kai Tak Cruise Terminal, won the award for “Best IT Management Award” from the China Cruise and Yacht Industry Association. Advertisement opportunities now available at Kai Tak Cruise Terminal. Click here to download the file for more information. For enquiries, please contact 3465-6888 or Email Us for more information.